During the last few decades, commercial gambling has increased substantially throughout the Western world. More people than ever before have access to sources of legalised gambling, leading to bumper revenues for the institutions involved. Naturally enough, this has led to an increased interest in the area of the economics of betting. This book addresses the issues raised by the continued growth of the gambling sector. How can we model the behaviour of people who seemingly act irrationally? What are the implications of different tax policies with regard to gambling? Are casinos capable of taking money away from state-run lotteries and the causes they fund? Can bookmakers’ odds be influenced in such a way as to make the gambling market inefficient? The authors in this volume provide insights based on data from many different countries, including England, the USA, Australia, Spain and Cyprus. This volume brings together work which addresses the economic impact of the huge growth of commercial gambling in the Western world, as well as trying to model the cognitive processes which can explain why individuals are prepared to behave in such apparently irrational ways. This book was published as a special issue of Applied Economics. The academic editor of this journal is Mark P. Taylor. David Peel is a Professor in Economics at Lancaster University Management School. He has held previous posts at the University of Liverpool, Aberystwyth and University of Cardiff. 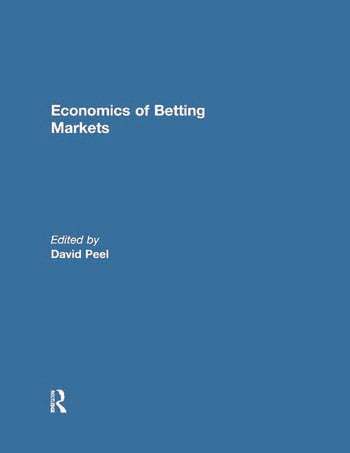 Professor Peel has published widely on empirical and theoretical issues in macroeconomics and the economics of gambling markets.